Staying in Hotel Stayen, that's staying in comfortable luxury. The hotel resolutely opts for a good three-star product. The rooms are decorated with timeless design and equipped with all modern comfort, with above all the warm Limburg hospitality. 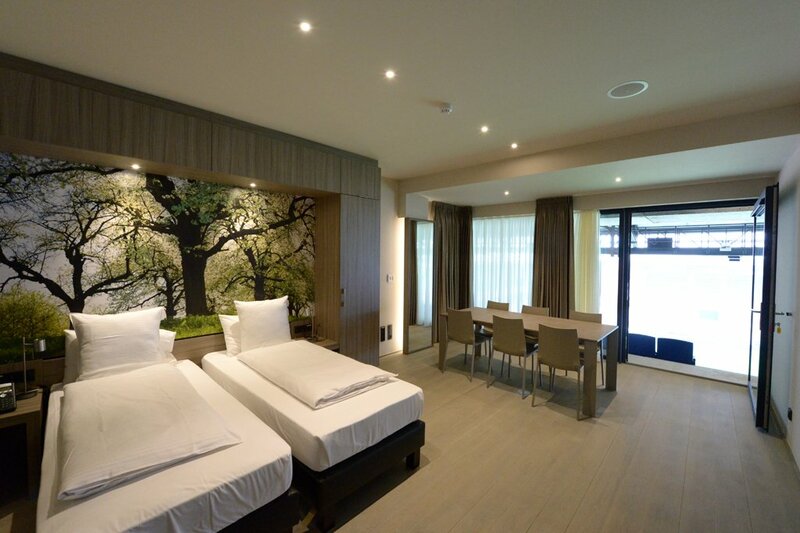 Hotel Stayen has 77 rooms: of which 21 skyboxes and 20 comfort rooms with a view on the football field. Make sure to ask in advance if you want to enjoy the special view. The rooms are spread over 5 floors in the North stand and 1 full floor of skyboxes in the West stand. The 21 new skyboxes are 45 m² in size and have private seats with a view of the football field. These skyboxes are not available on match days. In addition, the hotel has 43 comfort rooms of approximately 30 m2, 3 family rooms (these are 2 separate rooms with connecting door), 5 standard rooms (20 m2), 1 fully equipped room for disabled people (31 m2) and 1 studio of 54 m² with kitchenette. All rooms have the most modern home automation, air conditioning, flat screen, safe, free wireless internet, parquet floor, bathroom with shower or bath, free coffee and tea making facilities and a free bottle of water on arrival in the room. You sleep in high-quality box-spring beds in the majority of the rooms and we have 2 rooms with extra comfortable, pressure-reducing electrically adjustable Tempur-mattresses. If you want to test this, please ask for it beforehand. You can also enjoy our wellness and fitness facilities as a hotel guest.